SEOUL (Reuters) - South Korean President Moon Jae-in lauded Russia's participation at the Winter Games on Tuesday, saying it had "made our Olympics better", despite calls from some athletes and anti-doping agencies for Russians to be banned from competing at the event. 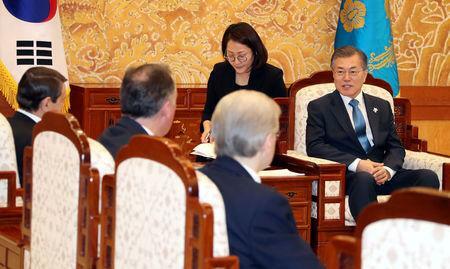 Moon made the comments after giving a reception for Russian sports officials at the presidential Blue House in Seoul, two days after news broke of a doping scandal at the Pyeongchang Games involving a medal-winning Russian curling athlete. Russia has been dogged by allegations of systematic doping, which Moscow denies. That had led to calls for an Olympic ban, though the International Olympic Committee (IOC) opted at Pyeongchang to allow them to compete as neutral athletes. "I thank you immensely for sending a large group of athletes to the Pyeongchang Olympics despite many difficult issues inside Russia," Moon told the officials. "The participation of Russia, previous Winter Olympics host and strong winter sports country, has not only made our Olympics better but has also contributed to South Korea's efforts to create a venue of peace and harmony at the Pyeongchang Winter Olympics." The new doping scandal, involving Alexander Krushelnitsky, who won a bronze medal in mixed-doubles curling with his wife, has cast a shadow over Russia's Olympic programme. The Russians were hoping that a clean record at Pyeongchang would persuade the IOC to allow them to shed their neutral status at Sunday's closing ceremony and to march behind a Russian flag and in national uniform. The IOC has yet to decide. 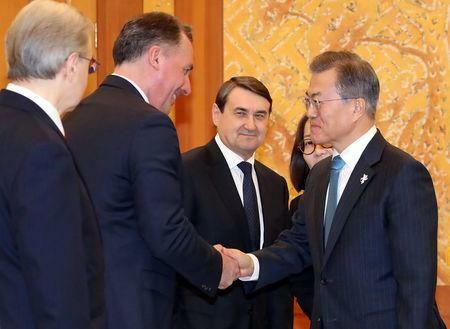 At Moon's reception, he met Igor Levitin, an aide to Russian President Vladimir Putin, who invited Moon to meet his Russian counterpart when Russia hosts the soccer World Cup this year.